Further detail has emerged concerning defective homes in the Holywell Estate in Swords, and Fingal County Council’s continued inaction regarding potentially life-threatening home defects. A follow-up story by the Sunday Business Post last weekend “Fingal knew of Holywell fire fears in 2007” confirmed that Fingal County Council were made aware of significant fire safety defects in homes in Hollywell as far back as 2007. A fire in January of that year revealed that there was no fire-stopping between dwellings at the estate: Dublin Fire Brigade sent an incident report to the Local Authority following the fire. In April 2007 the Department of the Environment wrote to Fingal County Council outlining concerns and requested a full analysis be undertaken. By June Fingal had responded that “Our inspectors have very serious concerns about the specifications and quality of workmanship to the premesis. These matters go beyond the question of completion and raise ussues of the basic acceptability of the property”. Later correspondence in August noted that inspections had all reported serious breaches of fire safety requirements. In September 2007 the developer had “asserted that their construction complied with the Building Control Regulations. As per their obligations the developer’s agent certified the compliance of this development with the Building Control Act”. It took Fingal County Council 5 years to commission an independent fire report which was never made public- rather it was published by the Sunday Business Post in August 2016 after a freedom of information request by the newspaper (see article Here). This report identified serious breaches of fire regulations in the Holywell development and examined typical apartments at ground, first and second floor level (see report Here). 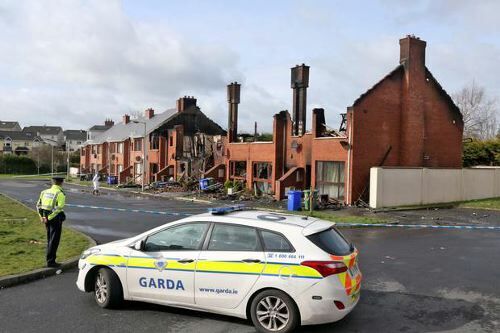 Although remedial work was carried out by the Local Authority to make 55 homes safe, at a cost of up to €20,000 per apartment, Local Authority tenants were not made aware of the dangerous state the units were in at the time and were not evacuated. Repairs appear to have been made when units became void and in a piecemeal basis. Defects identified in the report relate to ‘typical’ dwellings and may affect not just Local Authority tenants but hundreds of homes owned privately. Local Councillors are currently asking why Fingal County Council has ’buried its head in the sand’ on potentially fatal defects for over 12 years, and what they are going to do now. Owners are still left living in fear of a potentially fatal fire safety event. Earlier this year the Examiner examined several high profile defective developments including Longboat Quay and Millfield Manor, Newbridge and some less well-known developments, Ath Lethan, Dundalk and Ceol na Mara, Waterford (see post Here) . The Examiner reported on how a freedom of information request from the Irish Examiner uncovered one of what could be dozens of examples of estates with fire safety defects which were quietly rectified, often from the public purse, without any publicity. The Irish Examiner understands it was deemed necessary for the council to pay for the work on private homes for reasons of access to the council owned properties within mixed private and social housing schemes. In Millfield Manor (pictured) 6 homes burnt down in 20 minutes. Under pressure presure from local residents the Local Authority and Department of the Environment commissioned an independent report into fire safety in the estate- again this report has yet to be published, over one year on. Owners have not been evacuated. Housing is ‘the number one priority for government’ and it’s time to ask how many other similar developments are seriously defective in the country. In the ten year period 2002- 2012 over 15,000 Part V houses and apartments built by private developers were purchased by the state. Why do Local Authorities continue to observe a ‘hands-off’ privatised system of self-certification by developers which has little or no consumer protection? Will the Government’s ambitious housing programme not be subject to independent inspection? A copy of the redacted report commissioned by Fingal County Council is here. Reintroduce State Inspection of Buildings | Mick Wallace T.D. This entry was posted in Building Regulations on October 20, 2016 by BRegs Admin. I downloaded the Michael Collins Associates/Michael Slattery and Associates (MCA/MSA) report. What shocking reading! Thank goodness a fire has never started in one of the apartments. If it had I wouldn’t have been surprised if the buildings had burnt to the ground as rapidly as the houses at Millfield Manor, with nothing left standing apart from the old bit of external blockwork. Worse still I would say that there would have been a far greatly likelihood the fire would have resulted in fatalities, because unlike Millfield Manor, which was a row of terraced houses, Holywell is a multi-occupancy, multi-storey apartment block with individual families living on top of each other, wholly reliant on compartment floors to separate them from fire below. Every party wall, every fire separating wall, every compartment floor in the entire complex is timber frame construction. Goodness knows how far a fire might spread through the development once it took hold! The plans in the MCA/MSA report indicate two two bedroom apartments per floor. These lead directly off the common staircore. There is no lobby between the apartments and the stairs, and therefore safe egress via the stairs is 100% reliant on the fire resistance of the front door and most crucially the fact that the door will self-close if the occupants fleeing from a fire in their apartment evacuate to safety and don’t stop to close the door behind them! The separating walls between the stairs (the sole means of escape for occupants of upper floor apartments) and the apartments are also timber construction. Not only that, the gas riser has been taken up the stair core! I’ve never seen anything that looked more like a death trap in my life! The elements of structure in an apartment buildings are usually required to have 60 minutes fire resistance. The elements of structure in a timber frame building comprises the timber frame – a combustible material – the perfect fuel for a fire. Generally the fire protection is 25/34 mm of plasterboard. Plasterboard is actually designated a material of limited combustibility – not a non-combustible material. I’m aware of fire testing of stud partition walling – but when building a multi-storey, multi-occupancy apartment building perhaps that distinction should give pause for thought? At least the structure and separating walls and floors in Longboat Quay are of non-combustible construction – so the building won’t turn to ashes in 30 minutes! Holywell poses life-threatening dangers to the people living in it. The Local Authority know this from the MCA/MSA report. The Government know about it – if only through the press and the freedom of information request. But no one seems to care about anything other than reputation and the cost of remedial works. Is that the worth of the occupants of Holywell?